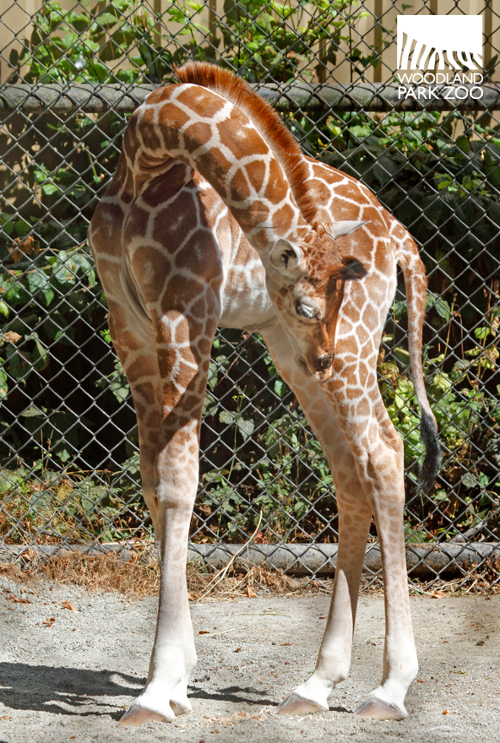 The giraffe calf has grown nearly a foot since his birth 3 weeks ago, towering in at just about 7 feet tall now. But there’s another tell-tale sign of growth to look for: the formation of the calf’s ossicones. Notice mom’s fully formed ossicones and the little ones just starting to take shape on baby’s head. 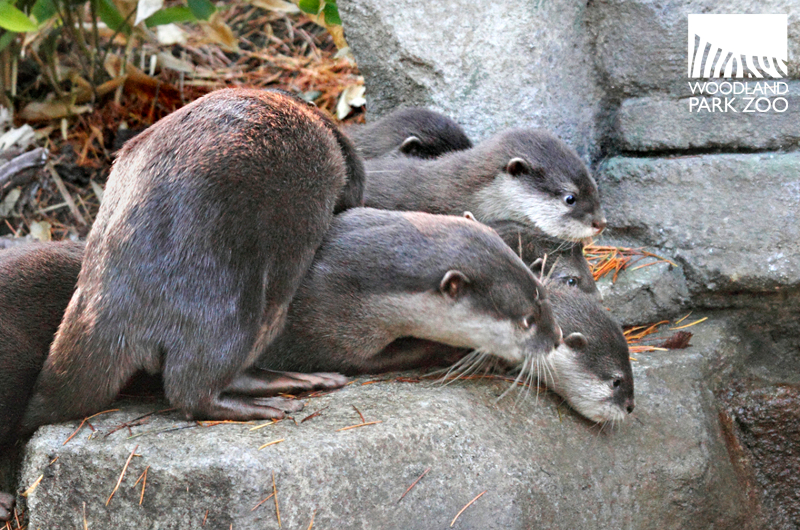 Photo by Dennis Dow/Woodland Park Zoo. 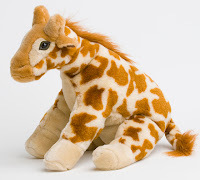 Ossicones are the horn-like protuberances giraffes sport on their heads. They are formed from ossified cartilage (cartilage that has transformed into bone) and covered in skin and fur. Remember what looked like a little tuft of hair on baby when he was first born? One-day-old giraffe with flat ossicones. Photo by Ryan Hawk/Woodland Park Zoo. Those were his little ossicones, all flat and barely developed. But over the weeks they have begun to harden. You can see in these pictures at one-week-old how the ossicones are beginning to take shape. One-week-old ossicones, the front view. 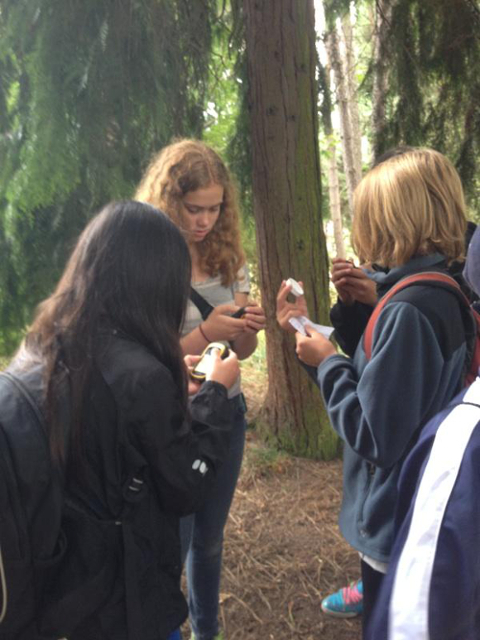 Photo by Dennis Dow/Woodland Park Zoo. Ultimately, they’ll stand tall and strong on his head as he matures, a sparring weapon handy for competing with other males for food or perhaps a mate. The growing boy. Photo by Dennis Dow/Woodland Park Zoo. The calf's budding ossicones hint at all that is ahead for him in the future. Treasure these early days—he may be as tall as 18 feet before you know it. Video: 15 minutes of quality time with the 3-week-old giraffe, taken from the live web cam 8/28/2013. If you haven’t visited the giraffe family yet, afternoons are a good time to look for them in the outside area of the Giraffe Barn. You can also tune into the live web cam streaming from inside the Giraffe Barn between 5:00 a.m. and 10:00 p.m. daily. 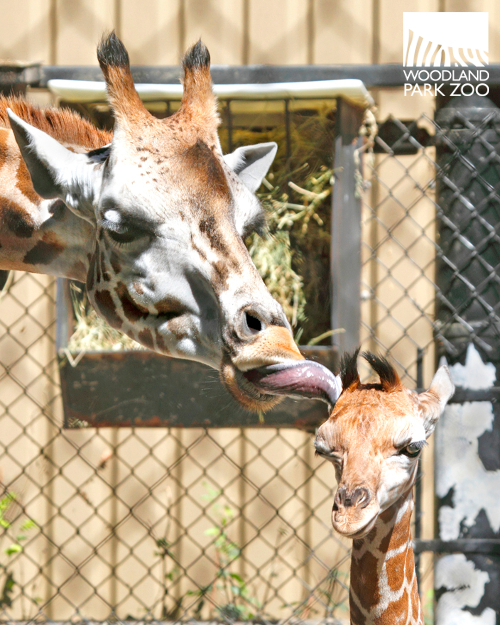 To show your giraffe love, adopt one today through our ZooParent program. Your adoption will help fund the daily care of giraffes and other zoo animals, and $5 of your adoption will go straight to our field conservation efforts around the world. African elephant Watoto watches Asian elephant Chai at play. Photo by Ryan Hawk/WPZ. As our dear friends and supporters of the zoo, I wanted to share with you the latest news from the Elephant Task Force. 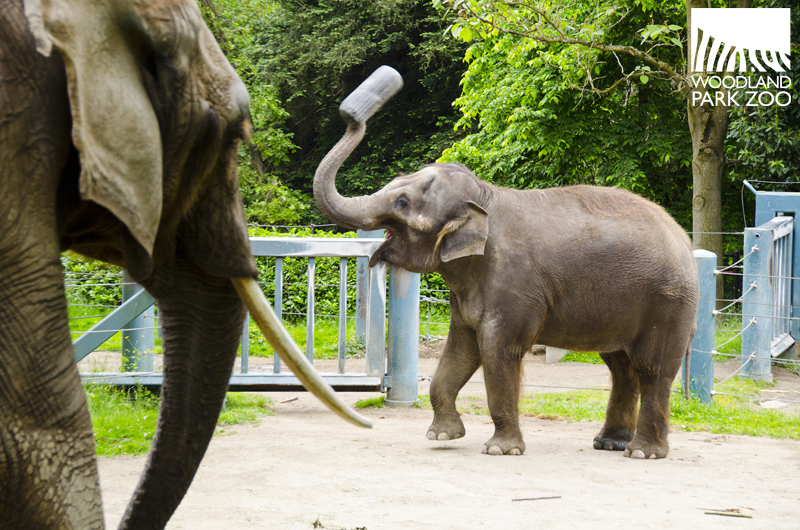 This group of community leaders was recently charged with providing an objective evaluation of the health and social well-being of Woodland Park Zoo’s elephants, and an assessment of the zoo’s elephant breeding program. Last night, the task force released a report from its Expert Review Panel comprised of six internationally recognized scientific experts in elephant care and behavioral health. The panel included respected scientific leaders from academic veterinary research and medicine, as well as animal science sectors. The Expert Review Panel reaffirmed that Woodland Park Zoo’s elephants Watoto, Chai and Bamboo are in good medical health and the behavioral and social well-being of all three elephants is good. The panel’s report also provided an independent evaluation of the zoo’s elephant breeding program and options for future success. Like you, your zoo is passionate about providing excellent care and is always focused on how to improve the elephant experience. The report also outlines ways to further enhance the zoo’s elephant exhibit and program, which the zoo’s elephant team and I welcome. The Expert Panel’s input is invaluable and we will review and consider it in detail. 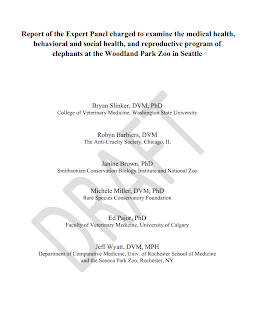 The Woodland Park Zoo Board of Directors and leadership greatly respect and appreciate the rigorous review of our elephant program by the Elephant Task Force and look forward to receiving the final and full report in September, 2013. We will share that report with you once it is available. Thanks so much for your support. 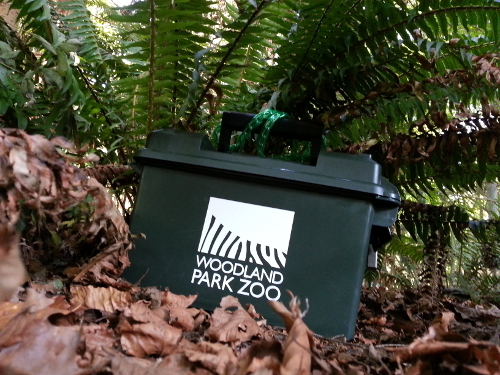 Woodland Park Zoo is a world-class zoo because of community members like you. You are truly helping to provide the very best in animal care here at the zoo and helping to save animals in the wild through your support. Mother Nature isn’t always kind. Just as some human babies are born with congenital conditions that throw their parents for a loop, leading them to make extraordinary commitments to their children’s special needs, the same can be true for animals. As you recall from last year’s stories, our endangered snow leopard cubs, Asha and Shanti, now 15 months old, were born with multiple ocular coloboma. This relatively rare congenital eye anomaly affects both human and non-human animals including Bengal tigers, Florida panthers, snow leopards, horses, and certain breeds of domestic cats and dogs. In Greek, coloboma means “unfinished.” The eye stops growing before it is fully developed. Ultimately, Asha and Shanti would develop functional vision only in their left eyes. Many of you wrote to us with outpourings of encouragement and hope for the cubs’ struggle, and for the expert staff caring for them. So I’d like to update you since they took their first baby steps in their exhibit a year ago. See for yourself! A picture is worth a thousand words. Asha and Shanti have been developing into thriving, rambunctious creatures that embrace each day with enviable gusto. 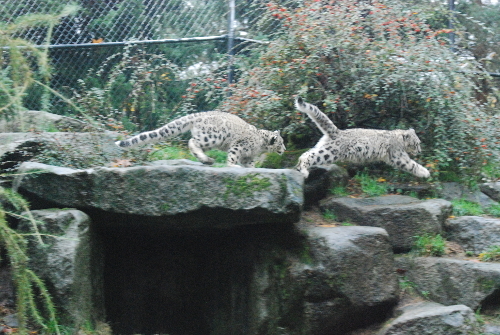 Leaping Leopards!! Several months later, a cub shows off her air-diving prowess just like her wild counterparts, which maneuver steep, rocky mountainsides as they travel to hunt prey. Photos: (Top) Ryan Hawk/Woodland Park Zoo; (Bottom) Ryan Harveland, WPZ member and avid photographer. In the wild, cubs with serious vision impairment might not survive very long. But at the zoo, because of excellent care from mom Helen, and our dedicated animal management and veterinary teams, these spots of beauty are leading vibrant, high-quality lives. They’ve mastered motor and navigational skills. But for a few small differences, which we monitor closely, they explore, play, leap and rough-and-tumble with the delight and earnestness that any fully sighted snow leopard cubs would. 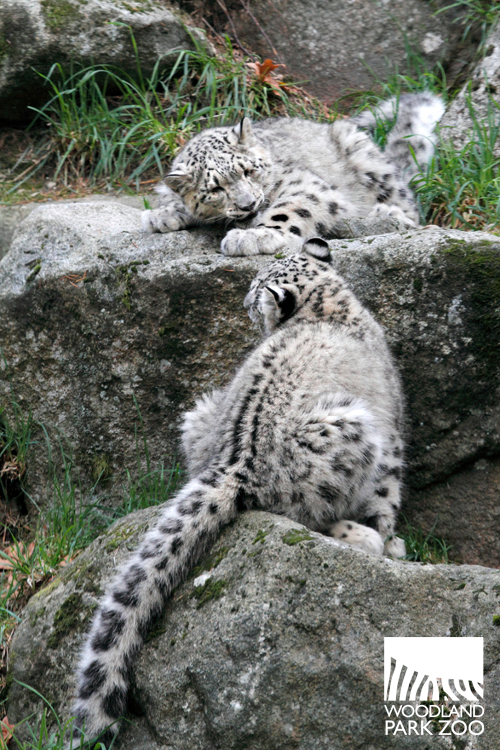 Helen has taught the cubs well how to bask in their glorious snow leopardness. The cubs learn all they can from mom, who has shown both skill, patience and diligence in helping Asha and Shanti develop. Photo by Ryan Hawk/Woodland Park Zoo. In turn, they are teaching all of us—zoo professionals, zoo members and our many guests—how to envision a better world for animals and people. Much like the snow leopard’s elusiveness, the etiology of coloboma remains puzzling. Scientists have more research to do to determine whether it is genetics or other factors, including environmental ones such as diet, that lead this eye malformation to develop in the embryo. Currently there is no cure for coloboma, but with continued research and medical collaborations, one may be possible. There is heartening news. Using blood samples collected from Asha and Shanti during veterinary exams, researchers at Cornell University and the University of Illinois, who specialize in veterinary ophthalmology, molecular diagnostics, and DNA studies on inherited diseases, have agreed to collaborate with their time and technology to pilot a research study using Asha’s and Shanti’s DNA. They will look for clues to a possible genetic cause of coloboma. 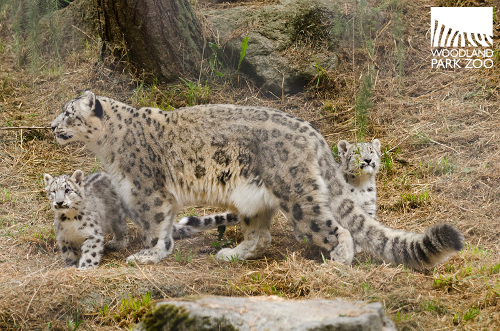 If a genetic marker is found, a screening test could be used to evaluate those snow leopards with a high risk of passing on ocular coloboma to their offspring. Adding to the research others have done on this condition will help zoo and conservation efforts to help this species have a healthier, sustainable future. As with any endangered species, continuing population decline puts pressure on genetic diversity. Native to the remote, mountainous regions of Central Asia, the wild snow leopard population has diminished precipitously in the last several decades. 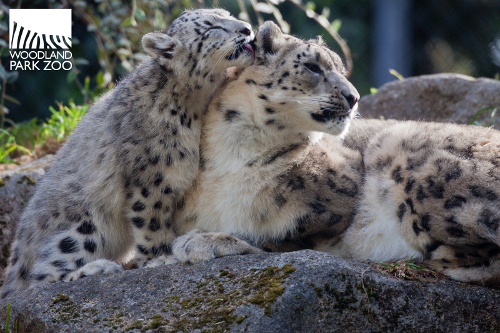 Scientists and zoo veterinarians know that snow leopards are more susceptible to certain health problems, such as pneumonia, hip dysplasia and papillomaviruses among others, than other large cats. Coloboma has been documented in captive snow leopards but not yet in their wild counterparts, as we are just beginning to gain deeper glimpses into the hidden lives of these “mountain ghosts.” Only recently, the first video coverage of snow leopard cubs in a den in the wild was achieved by the Snow Leopard Trust, one of our zoo’s Partners for Wildlife. What we learn from the ocular coloboma pilot study will contribute to improving the health of the captive population and add to other research being done on this species’ health as a whole. As has long been the case with zoo animals, we anticipate these combined efforts will produce insights and knowledge useful in the conservation of wild populations. Helen, above, and father Tom (not pictured) did sire two healthy cubs, Gobi and Batu, in May of 2009. Batu, now at Assiniboine Zoo in Manitoba, Canada, gave birth in July to her own cubs. They passed their health tests with flying colors. Photo by Ryan Hawk/Woodland Park Zoo. Several weeks ago, after close observations to evaluate some discharge in Asha’s and Shanti’s underdeveloped right eyes, Dr. Tom Sullivan, a veterinary ophthalmologist volunteering his expertise to the cubs’ eye care, and Dr. Darin Collins, Director of WPZ Animal Health, decided to remove the deformed eye to prevent infection and future complications. 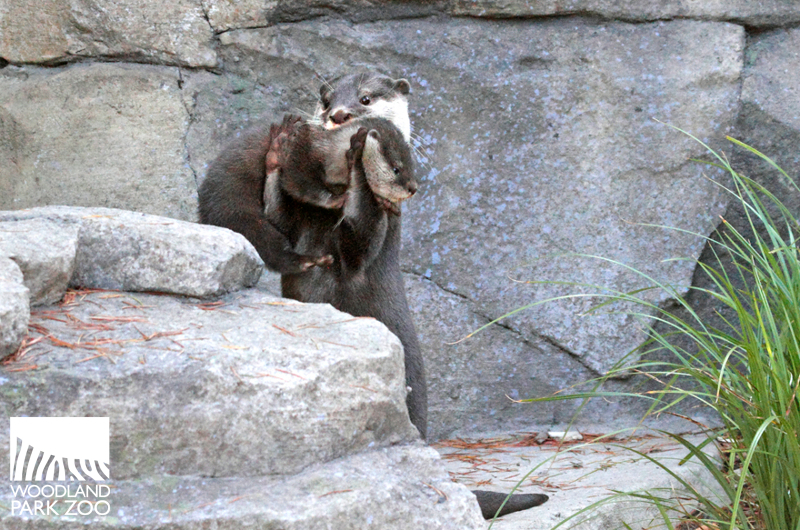 Since returning to their mom and exhibit, the girls are back to their antics and continue to excel. What’s in store for their future? 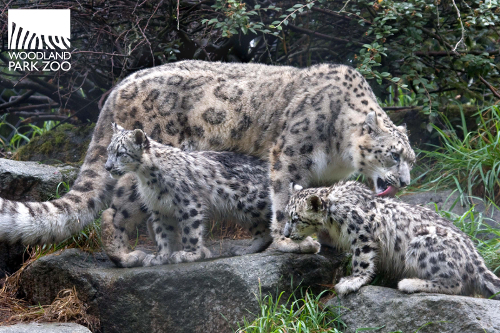 In the wild, juvenile snow leopards and their mothers typically part at about 18 months of age. 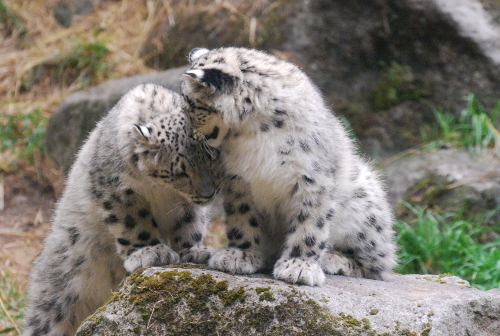 Asha and Shanti have been recommended to move to Big Bear Alpine Zoo, in California, by the Snow Leopard Species Survival Plan (SSP), a cooperative animal management and breeding program for populations in North American zoos and aquariums. Feisty and playful, there the sisters will continue to thrive together and receive specialized eye care. Although they will not be bred, they will continue to be outstanding conservation ambassadors. Showing some “luv” for mom. Photo by Jeremy Dwyer-Lindgren/Woodland Park Zoo. Looking into Asha’s and Shanti’s eyes, one’s initial sadness is quickly replaced with wonder and amazement at their zest for life. Every day is a new adventure on their journey to inspire us to learn, care and act to save their counterparts in the wild. 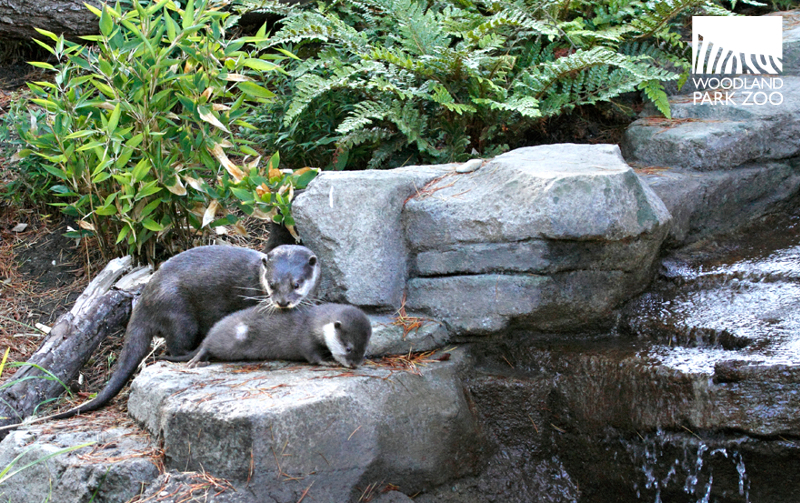 Be sure to visit them here at Woodland Park Zoo before they embark on their California trek this fall. Until then, I leave you with a thought often attributed to Helen Keller. While any loss of sight may be challenging, it is far worse to have sight but no vision. 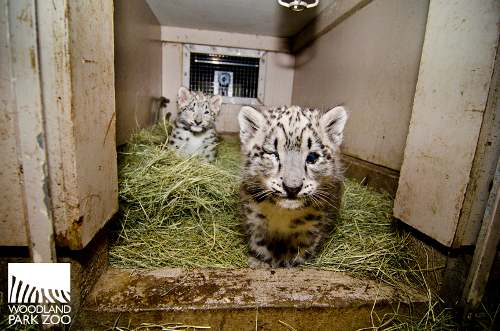 See these snow leopard cubs and I guarantee you’ll see the world in a whole new way. Photo by Annette Fallin, WPZ member and avid photographer. 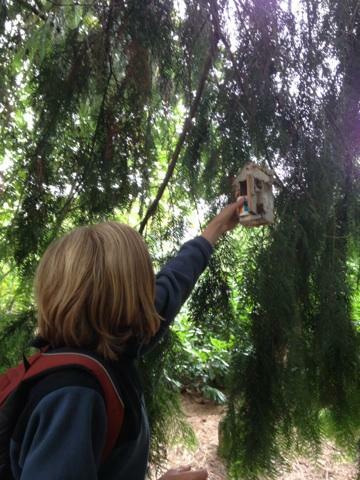 Visitors catch a glimpse of Gavin in the zoo's Raptor Yard. Gavin, our youngest porcupine, is stretching his legs and catching some rays in a spacious zoo yard, giving guests an up-close visit with—quite possibly—our cutest quilled creature. Gavin on the run in the Raptor Yard. While Gavin’s parents, Molly and Oliver, occupy the Northern Trail porcupine exhibit, Gavin takes to the zoo’s Raptor Center yard on weekdays for regular exercise and explorations under the supervision of zookeepers and staff. His visits to the Raptor Center yard are not formally scheduled, but you might catch a closer look at the pint-sized porcupine during your afternoon visits to the zoo! Notice the thick gloves required when holding Gavin and his quills. At 2 months of age, keepers began to notice a decrease in his weight, which for a young growing porcupine is a cause for concern. Upon examination it was discovered that Molly wasn’t producing as much milk as Gavin needed. The young North American porcupine went through a series of tests, including a CT scan, in search of any other concerns that may have been contributing to his weight loss and development but nothing significant was found. Soon Gavin stopped nursing from his mother, Molly. Without the nutrients he needed from his mother and no observations of him regularly eating solid foods, Gavin was separated from Molly for supplemental feedings to guarantee a hearty diet and positive weight gain. With progress, Gavin has begun eating a solid diet and now lives on his own. After a good run all around the Raptor Yard, Gavin is escorted back to his behind-the-scenes exhibit. Stroll past the Raptor Center yard during your zoo visit and keep an eye out for something small, black and covered in quills. If you’re lucky, you might spot Gavin on his next afternoon exploration. And that's why you wear protective layers around a porcupine. 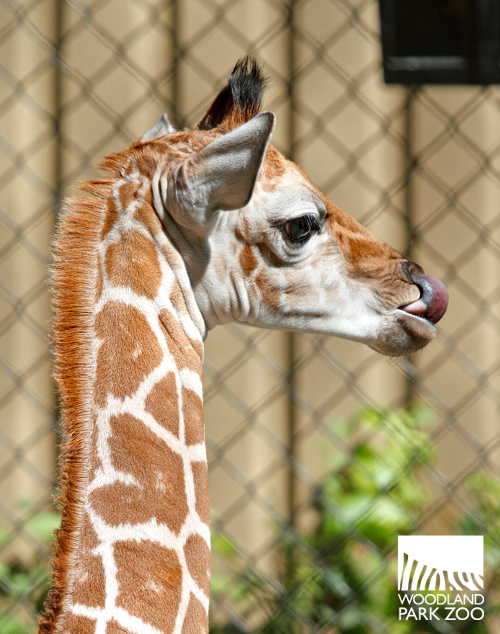 Don’t miss out on news on Gavin and the zoo’s many, many babies! 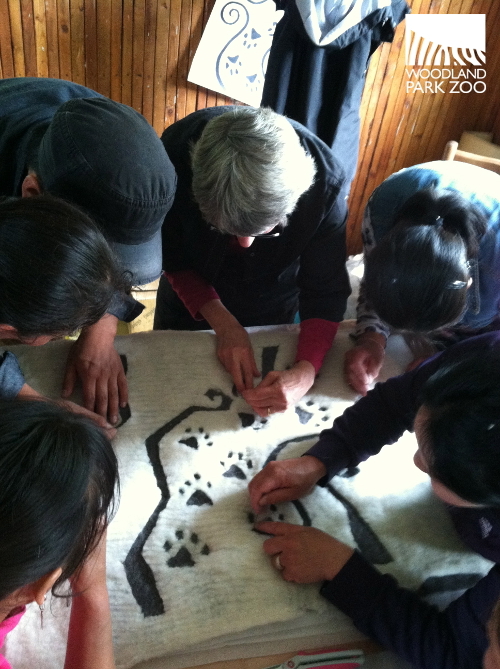 This entry is part two in a three-part series from ZooStore and retail manager, Terry Blumer, following his travels to Mongolia to help lead a conservation commerce workshop for local artisans, creating an eco-friendly income alternative to poaching in snow leopard habitat. The workshop was made possible by Woodland Park Zoo’s Partner for Wildlife, Snow Leopard Trust. Conservation Commerce products are available in the zoo's two ZooStores. Getting there...let the adventure begin! How does one begin to pack for an adventure in Mongolia? For starters, I need to make sure I know luggage restrictions. Sleeping bag? Check. Raingear and hiking boots? Check. Nifty, new solar charger for gadgets? Check. ATV tires? Che...wait, what?! Yes, I read that email correctly. "Would you mind checking an extra bag and box of donated ATV tires for our Mongolian office?" asked Gina Robertson, Snow Leopard Trust's (SLT) Product Development and Sales Coordinator in her latest email. So much for worrying about packing light! Jeff Brown from the SLT office gives Gina and me a lift to the airport. We pack his Subaru wagon to the hilt and head out to the airport. Bags and boxes checked and we're on our way. We meet up with Jennifer Snell Rullman, Assistant Director of Conservation for the Trust, and soon we are winging our way west on our 10-and-a-half-hour flight to Beijing, China. 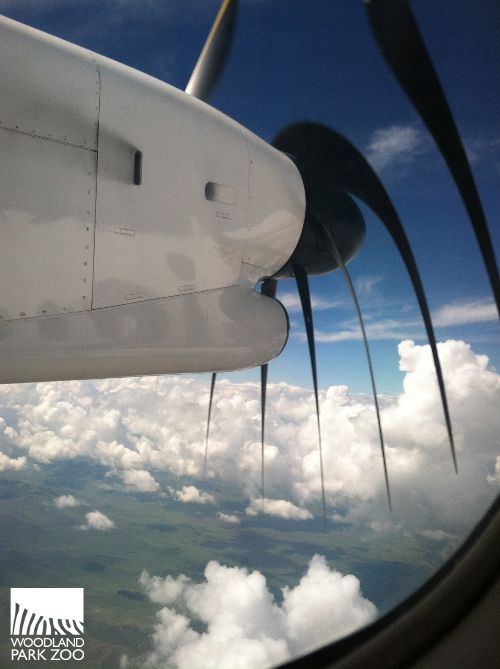 Our journey of more than 5,800 miles begins and it will ultimately take us two days to reach Mongolia. Despite chasing the sun west, we will touch down in a very smoggy Beijing. SLT's Gina Robertson and lots of baggage. Beijing Capital Airport is one of the largest in the world and just about everything in it shuts down after 9:00 p.m. We arrive at 11:30. Our connecting flight to Mongolia's capital city, Ulaanbaatar (UB), doesn't leave until 8:30 the following morning but thankfully for these three Seattleites there is an all-night coffee shop open in our terminal. We eventually discover that ticketing counter operating hours are apparently conceptual in this airport but by 8:30 we are finally off to UB. Mongolia is a vast, landlocked country with a relatively small population and enormous, untapped natural resources. 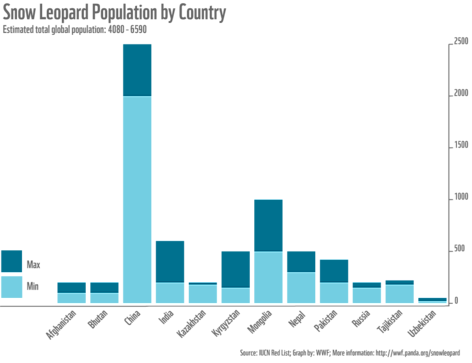 In the last decade or so, the country has gone through rapid growth and change as the world rushes in to develop or exploit their immense mineral deposits. The influx of industry and money is both a boon and a potential bane bringing rapid change to all of Mongolia. Ironically, we will witness this firsthand when we check in for our flight the next day and find an entire entourage of mining engineers from Rio Tinto in line next to us. 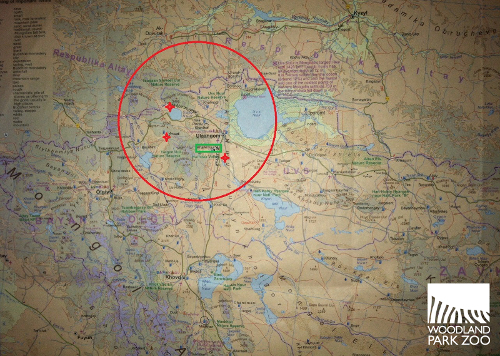 According to our translator, Nema, all natural resources underneath the ground are owned by all Mongolians. How the rapid influx of money rushing in as minerals go out will impact Mongolians will remain to be seen. Bemba, a Snow Leopard Trust Mongolian staffer, picks us up along with all of our luggage. Amazingly, almost all of it fit in that car. Ulaanbaatar, capital city of Mongolia. Central Ulaanbaatar, looking towards Suhbaatar Square. We meet others on the project team: American felting artist Sharon Costello and her husband, John Arraghi, our official photo documentarist, Tsend-Ayush, Executive Director of the Wool Craft Training Center (WCTC) and on the Board of Directors of Snow Leopard Conservation Foundation (SLCF)—she prefers to go by Aya, Nasanjargal (Nasaa), Trainer, Wool Craft Training Center, Batsaikhan Ts, Lecturer/Trainer, Mongolian University of Science and Technology, (MUST), Unurzul (Unuruu), Trainer/Designer SLCF, and Narangerel (Naraa) SLCF from the Mongolia SLT office. Our journey not yet over, we fly from UB in the central region, another 1,000 km to Ulaangom, regional capital of the aimag Uvs. Aimag is similar to a state or province. After a brief supply run we head out to the workshop site, a recreational mountain camp situated in Harhitaa valley in the foothills of the twin peaks Turgen Uul and Kharkhiraa Uul in the heart of Turgen Uul Nature Reserve. 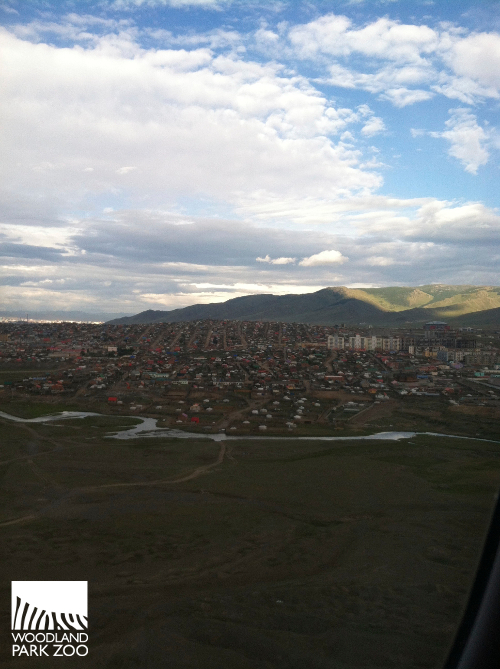 Our trusty transport to Ulaangom, regional capital of Uvs aimag. The road to Kharkhiraa Mountain Lodge. Terry Blumer at Kharkhiraa Uul (Mountain) in the clouds. The plan is for 45 herders to join us for five days of intensive training and product development. Participants hail from the various communities of Uvs, Bayan-Ulgii, Khvod and Gobi-Altay. Unuruu has spent months developing a well-planned workshop including coordinating the best timing for the communities. Yet the opportunity for unseen factors is always present and in this case the herders from Bayan-Ulgii are unable to make it due to a regional health quarantine. This is disappointing to all, yet totally beyond anyone's control. Still, the workshop is set and designers and crafters are about to come together. Location of workshop and surrounding area. Workshop participants learning new techniques. In my final update, I’ll share more snapshots of the workshop and surrounding Mongolian countryside including the Uvs nuur Strictly Protected Area. And we’ll see what happens when the designers and crafters finally meet up to collaborate on new product designs during the workshop. Stay tuned! Two pups follow mom outside for the very first time. 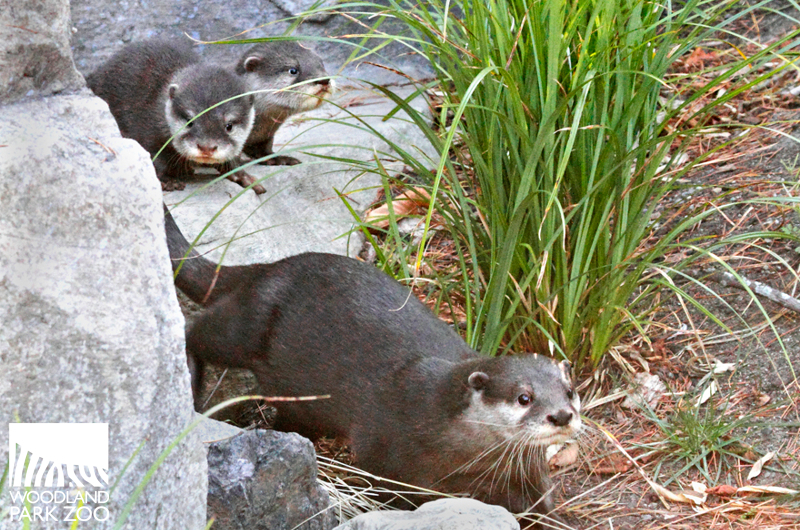 Everyone is busy getting the Asian small-clawed otter pups ready for their outdoor debut. Mom and dad have been teaching the pups how to swim in a shallow, indoor pool in their behind-the-scenes den. 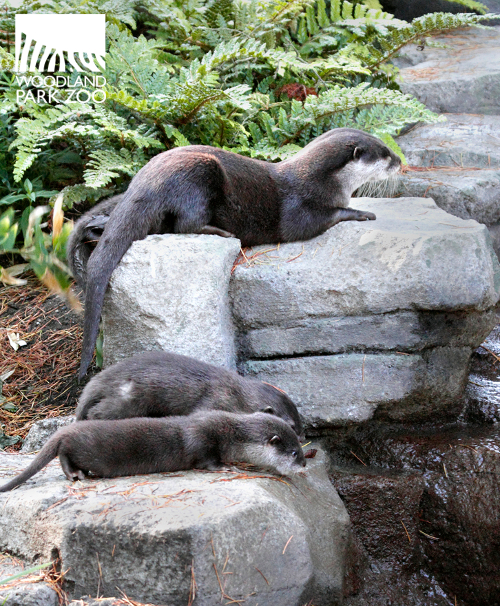 Zookeepers have been baby-proofing the outdoor exhibit—adding ramps made from branches to the water and slowing the stream and waterfall down to a trickle so the pups don’t wipe out. The pups followed mom onto exhibit briefly. All is set. Now we just need to get the pups to come outside for a little practice time. That’s proving to be the hardest part. 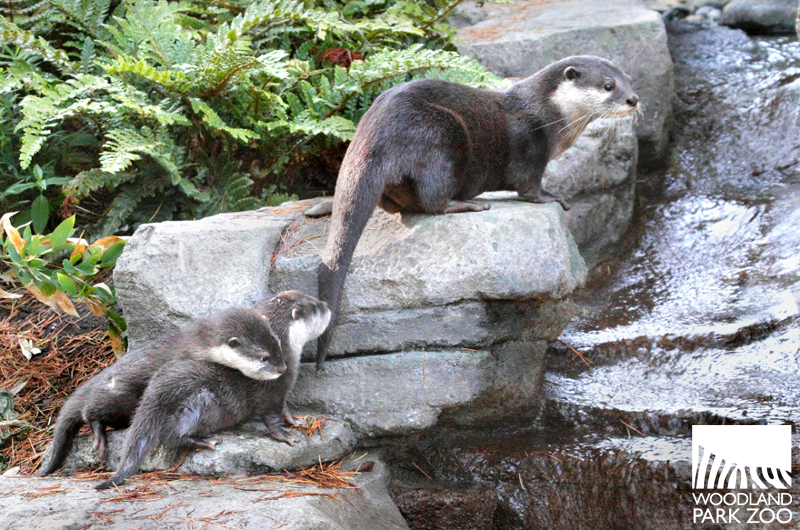 Taking a peek at the waterfall on exhibit. Last Tuesday morning, mom Teratai guided her pups out onto exhibit to give them a chance to explore the outdoors for the first time. Notice the little patch on the pup's side? Each pup has a unique shaved patch to help keepers tell them apart at a glance. She ushered the pups out and as she was busy trying to get them to head towards the water with her, overprotective dad Guntur would come around and usher them right back inside! He’s very cautious with the pups and it may take him a little while before he feels comfortable letting them romp around outside for longer periods. Dad scoops up a baby to take him back inside. In total, the pups had about 10 minutes outside on their first day, but that adventure was eventful enough for their tiny bodies that they crashed into nap time soon after and didn’t pop back outside for the rest of the day. That's far enough for one day! These intermittent introductions will continue in little bursts to build up the pups’ confidence and experience outside, while building up Guntur’s comfort as well. 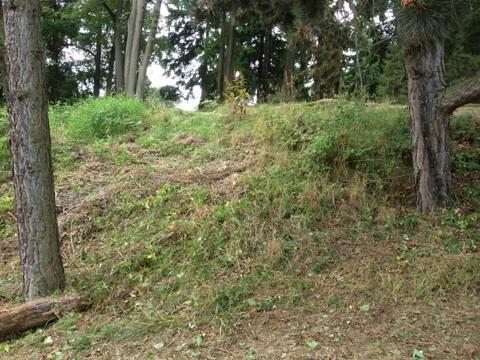 Then we’ll be ready to provide more regular outdoor access and visitors can begin to see the family on exhibit. We’ll be sure to announce when that time has come! Mom Olivia and aunt Tufani give the little calf some tender attention. Photo by Ryan Hawk/Woodland Park Zoo. 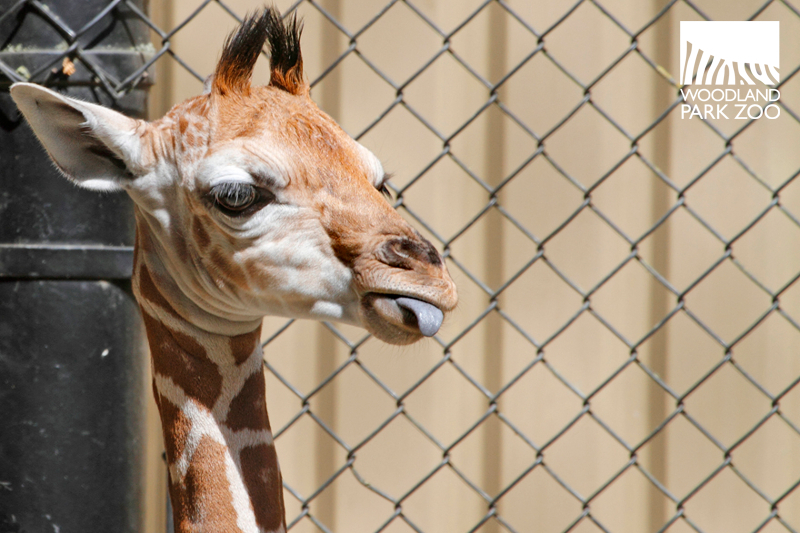 At just 1 week old, Woodland Park Zoo’s male baby giraffe has become an overnight sensation, and now, it just gets better. 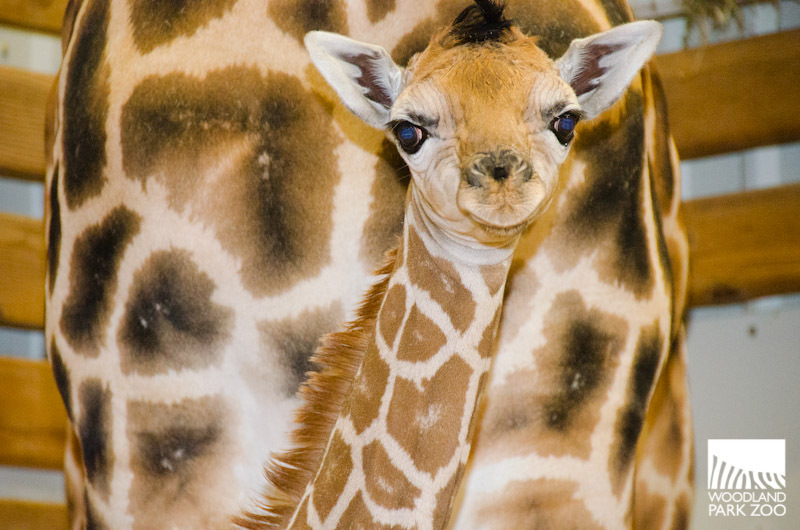 Giraffe fans can get their daily fix of the tallest baby in Seattle through a live 24/7 animal cam, courtesy of Dropcam. The live cam is installed behind the scenes in the giraffe barn and allows the public to watch the calf nursing, bonding with mom and doing what babies do…sleep. The best viewing times for the live cam are between 4:00 p.m. and 10:00 a.m. PST. 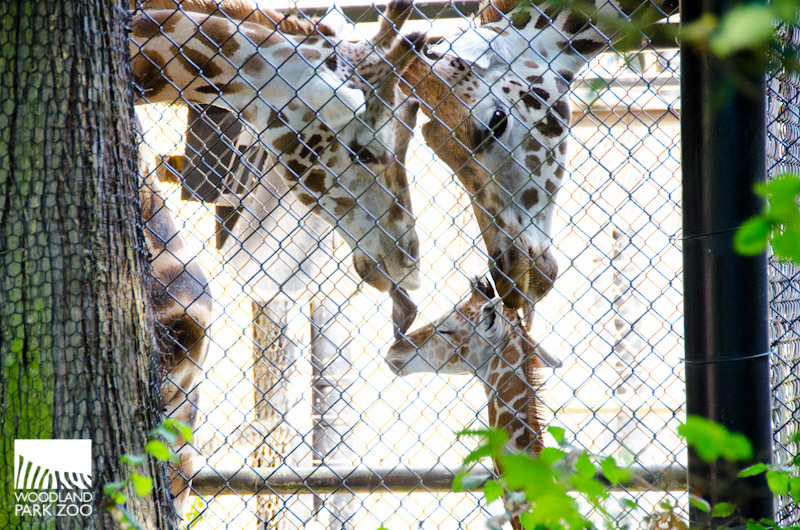 The baby giraffe was born August 6 to 6-year-old Olivia, a first-time mom. Born at 6 feet tall, he now stands at 6 feet, 4 inches and continues to thrive under the care of his mom. Olivia has been an excellent mom and the baby’s progressing on the mark. He’s playful and is beginning to sample hay, grain and leaves, which you can sometimes view from the cam. Mom and the baby now have access to the outdoor corral beginning around 11:00 a.m. daily and are given the choice to go off view in the barn as they choose. Watch some giraffe cam highlights from yesterday morning to see what you'll enjoy when you tune in. Video: Giraffe cam highlights (recorded, not live). 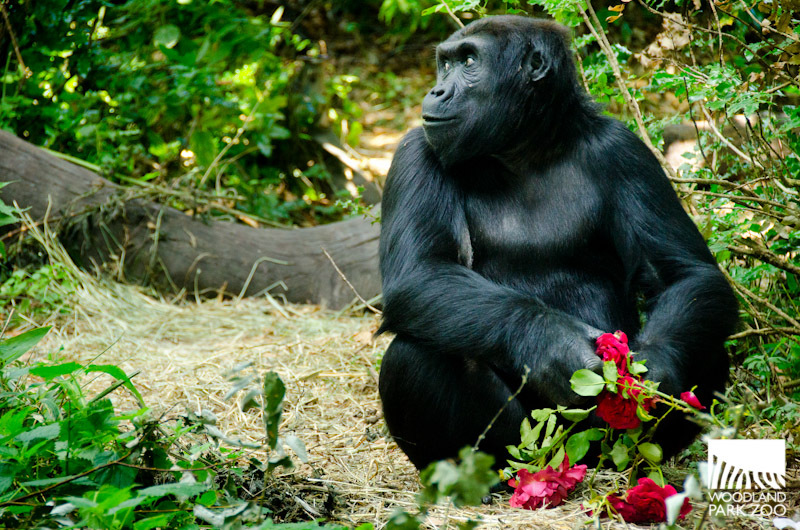 Roses may symbolize love and beauty to us, but to our gorillas, they symbolize snack time! 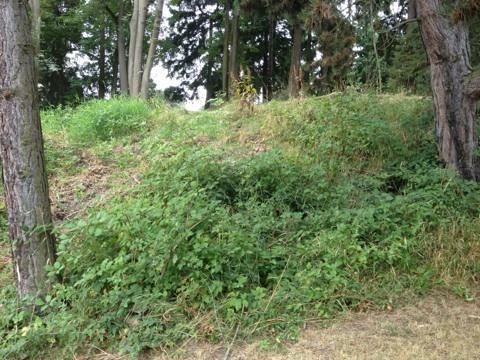 Thanks to the organic methods our gardeners use in the Woodland Park Rose Garden, any trimmings of our blooms are perfectly edible and safe to eat for our gorillas. In the summer, as the more than 3,000 rose plants in the nearly 90-year-old Rose Garden bloom, the zoo’s gardeners deadhead the plants, which means they remove old, spent blooms to keep the overall plant blooming longer. 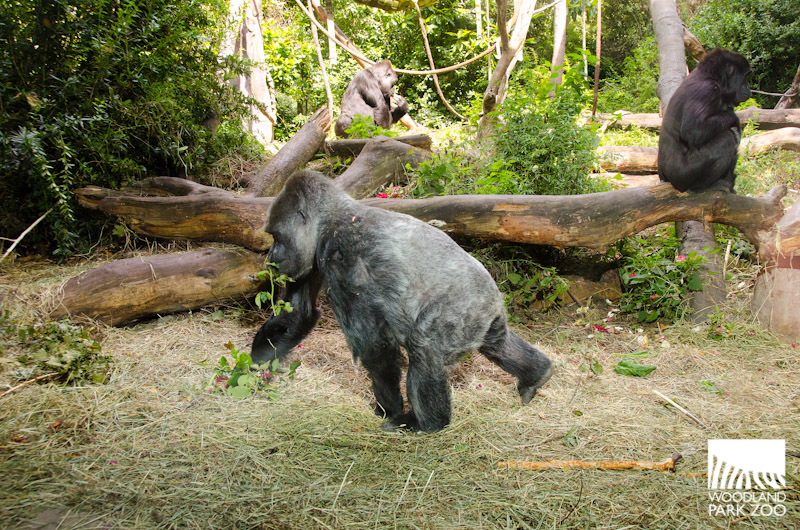 That waste could be composted, but zookeepers love to get their hands on the blooms to use as enrichment with our plant-eaters, most especially the gorillas! The petals make their way into the gorilla exhibit two or three times a week in the summer at various hours to keep it interesting and unexpected for the apes. This week, we visited the gorillas on a Monday morning and watched the blooms and petals rain down on the gorillas as keepers sprinkled the flowers into the exhibit from a rooftop perch. Our youngest gorilla, 5-year-old Uzumma, was the first to notice the keepers on the rooftop and she climbed high for a good look at what treat was to come. But it was Calaya, who remained on ground level, that got first dibs as the petals dropped down, spreading a feast all around her and the others. 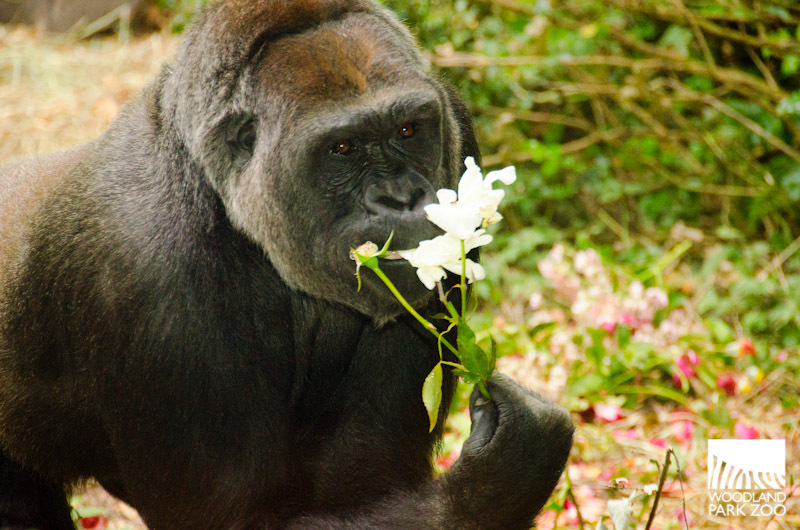 What a treat to see some of the gorillas pick up the blooms and actually stop to smell the roses (literally!) before taking a bite. The oldest of the gals in this group, Amanda, took two fistfuls of roses and headed away from the younger ones to snack in peace. Her snacking style seemed to lean toward stuffing her mouth with petal after petal after petal, while the others chomped on whole blooms all at once. 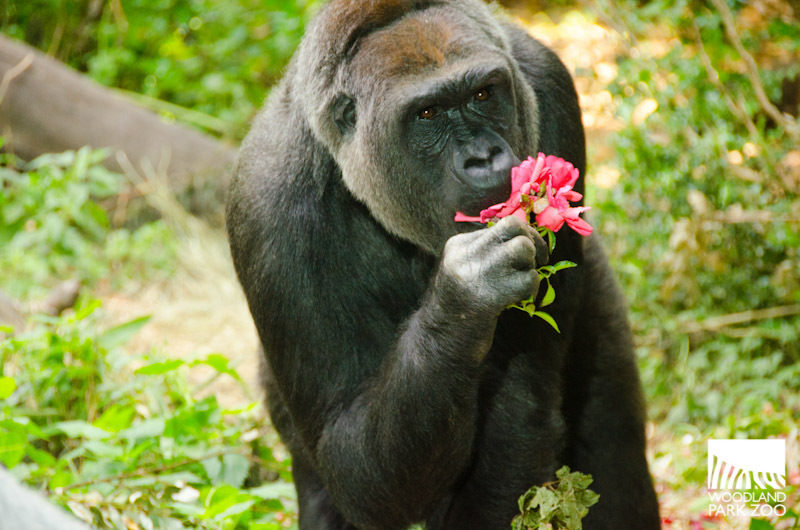 Roses stimulate many of the gorillas' senses, making it an ideal enrichment treat. The organic gardening practices really bring out the fragrance of the flowers, with no chemicals masking one of nature’s most perfect scents. The taste is sweet and irresistible to the gorillas. 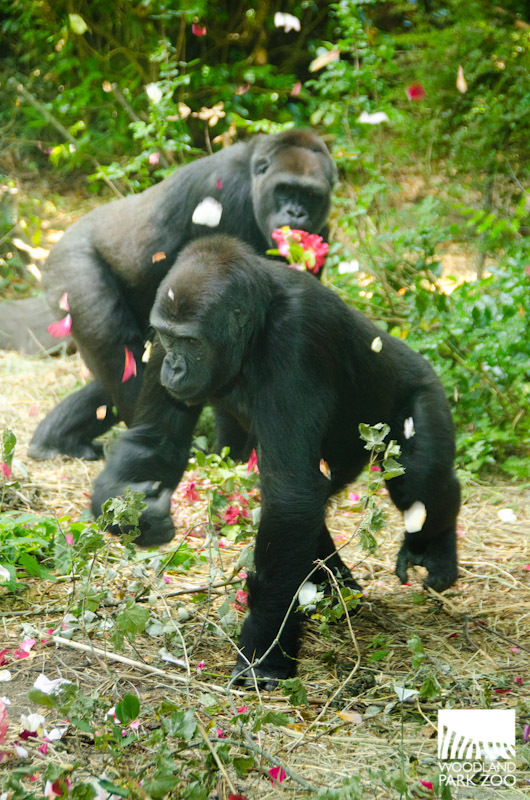 With their sharp, color vision, the gorillas find the flowers and petals floating down from above as visually arresting as we do. Branches come with thorns and all, but with their thick skin and expert plant picking skills, these apes have no problem dexterously handling the treat. When we took the flower show over to our oldest gorillas, Pete and Nina, both 45 years old, the reactions were a bit slower but still enthusiastic. Pete prefers bamboo, but he didn’t exactly say no to the roses, munching from a handful of blooms that looked all the more delicate in his massive hands. Nina let the petals rain down on her as she sat in her classic, comfortable style: tongue out, holding a stick, taking in the sun. After a while, she gave the blooms a taste, eating them whole, one after the other. Thanks to the organic, earth-friendly practices of our zoo gardeners, we’ll be able to keep these rose treats going for the gorillas through the end of bloom season. Look for this enrichment on your next summer visit—even if you don’t see it happen live, you might just spot a leftover petal or two in the exhibits and you’ll know where they came from! Then don’t miss out on your chance to see the Rose Garden in its blooming glory. 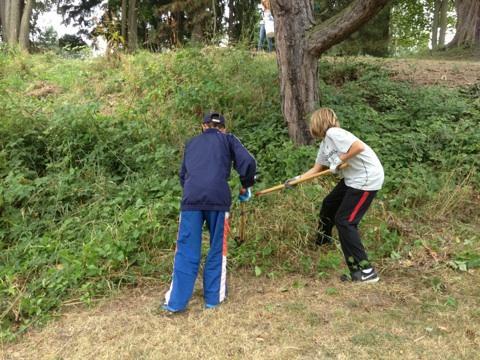 It’s free to visit and located just outside the zoo’s South Entrance off N. 50th Street and Fremont Ave. N.